Seventh grader Riley Bass takes a turn cleaning the tank. One of the largest aquaponics systems in the northeast United States has found a home at Colonial Middle School. 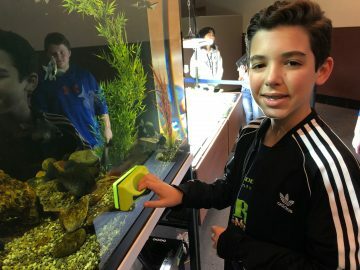 The school’s light court now houses a 250-gallon fish tank, four growing beds, special lights and a filtration system to support live fish and live plants. “Basically, we feed the fish, and the fish’s waste gets processed in the tank and pumped out into the water where the plants are feeding. It acts as a fertilizer for the plants and enables them to grow quicker,” said CMS eighth grader Shane Murphy. Aquaponics has a natural connection to the sciences classes in all three grades at CMS, and the seventh-grade science teachers planted their own crop of purple zebrina, a plant they use each year to study stomata, the cells that let the gases and water out of plants, under a microscope. Other classes are using the aquaponics system, as well. Eighth-grade social studies students are growing their own plants for a lesson about Jamestown, and the family and consumer science department has planted basil. 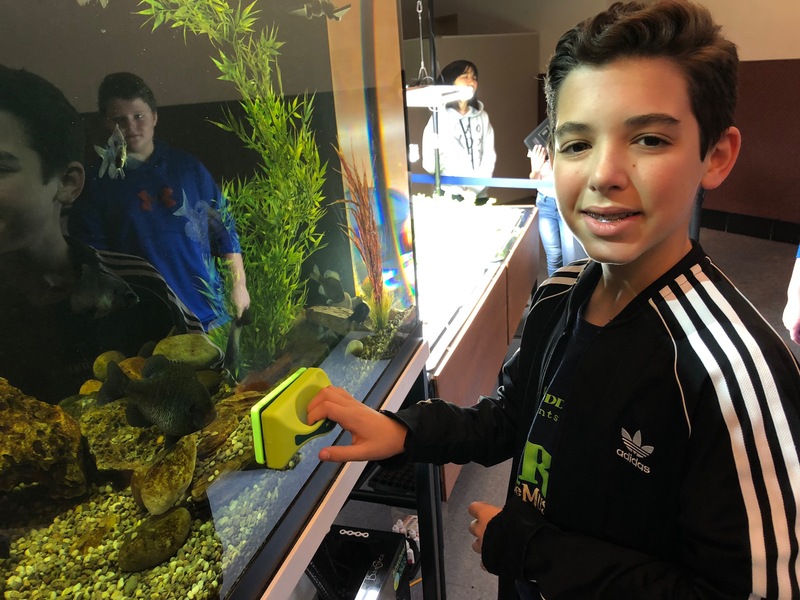 “We’re happy that a lot of the different subject areas are diving in right away and using it,” said aquaponics club adviser and seventh-grade science teacher Bill Ryan. Riverbend Environmental Education Center in Gladwyne has installed several aquaponics systems in Colonial and around the region, including this new system. In addition to providing all of the mechanical parts, Riverbend also brought healthy bacteria from an existing system and native Pennsylvania fish, including minnows and bluegill, from the Schuylkill River.